Here is an ideal gift-a sweet, huggable doll perfect for baby showers, new parents and babies, birthdays, and even graduates of all ages. 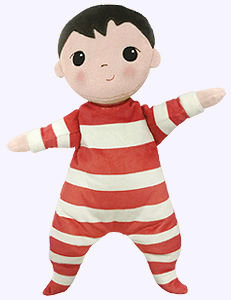 This snuggly doll�s super soft, velvety plush and wide open arms will captivate and engage even the youngest child. Doll is 13.5" tall. Surface wash only. Safe for all ages. 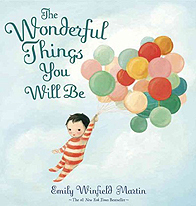 From brave and bold to creative and clever, Emily Winfield Martin's rhythmic rhyme expresses all the loving things that parents think of when they look at their children. With beautiful, and sometimes humorous, illustrations, and a clever gatefold with kids in costumes, this is a book grown-ups will love reading over and over to kids�both young and old. A great gift for any occasion, but a special stand-out for baby showers, birthdays, and graduation. The Wonderful Things You Will Be has a loving and truthful message that will endure for lifetimes. 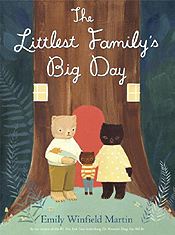 Hardcover Picture Book. Ages Birth to five. 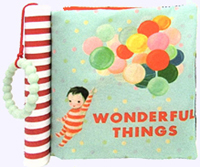 The Wonderful Things You Will Be Cloth Book features a colorful teether spine and hanging teether. Crinkle and interactive pages add to the soft cloth book's story of The Wonderful Things You Will Be.